The Marylebone Music Hall in the High Street, Marylebone, London was built for Sam Collins who would later go on to open another and better known Music Hall in Islington which carried his name, Collins Music Hall. The Marylebone opened in 1856 as a Music Hall attached to a public house called the Rose of Normandy. The Music Hall could accommodate 800 people and was built at the not inconsiderable cost for the time of £8,000. 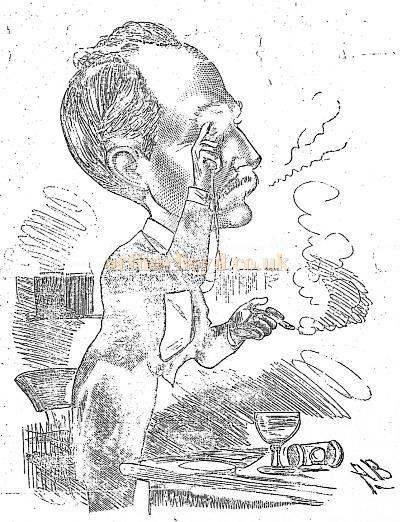 Left - A sketch of Charles Wilkins - From the Entr'acte, 18th September 1886. The Entr'acte went on to say:- '...The late manager-chairman of the Marylebone was quite an autocrat in his way, and his manner of dealing with those delinquents who interfered with their neighbours' enjoyment had more of the fortiter in re, perhaps, than the suaviter in modo about it. Mr. Wilkins was righteously severe on those young persons who sometimes on Saturday night asserted themselves unnecessarily, and thus produced discomfort and confusion. He would not tolerate deliberate outrages of decorum, and was in favour of dealing with such outrages in a summary fashion. The Marylebone Music-Hall, with which Mr. Wilkins was associated for so many years, and in which he could not have taken a more lively interest had the place been his own, has by his death lost its most distinguishing characteristic, for he was even better known there than the proprietor himself. It must be admitted that Mr. Robert Betting consented to the prominent part which his manager-chairman performed in the establishment for so long a period, and never attempted to disparage his judgment or his ruling. 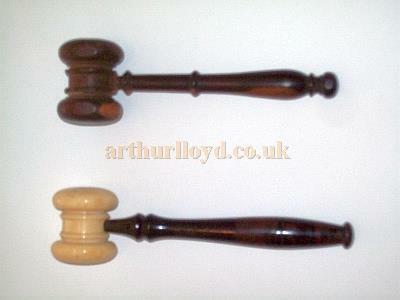 Right - Charles Wilkins Gavels as used by him as Chairman of the Marylebone Music Hall - Courtesy Richard T. Jones, his maternal G. G. Grandson. The above text in quotes (edited) was first published in the Entr'acte, 18th September 1886. Arthur Lloyd appeared at the Marylebone at 9.50pm on his first day of performing in London, on the 12th of October 1862, directly after his London debut at the Sun Music Hall in Knightsbridge at 9.00pm. The Marylebone Music Hall was in business right up until 1900. Above Left - An advertisement for the Marylebone Music Hall from the February 2nd 1884 edition of 'The General Theatrical Programme,' a weekly Newspaper and Guide to Theatres, Music Halls, etc. Click for a Special Feature on this edition. If you have any more information about this Music Hall, or images you are willing to share please Contact me.